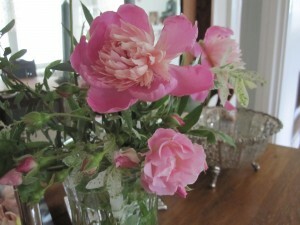 Below you will find a photo of peonies that bloomed in my garden this morning. For some reason this is a once in three years occurrence so I greet each bloom with excitement. They are among the most beautiful peonies I have seen, and the scent is intoxicating. I have been a gardener for as long as I can remember. Growing up in a suburb of Johannesburg, South Africa, I remember my mother at work with her roses, about 50 bushes of various varieties, secateurs in hand as she deadheaded, debudded (to leave only one rose on a stem) and carefully removed aphids and other undesirable pests. My grandfather who spent a third of every year with us always wore a fresh rosebud in the lapel of his suit jacket. When I was an adolescent I was given the rock garden as my provenance and loved to plan and plant and move rocks. My nemesis was the snails who shared my rock garden. Johannesburg, situated on a plateau at 6,00 feet, and with a temperate climate, dry heat and usually reliable summer rain, is an Eden for gardeners. There is one drawback, cyclical drought and with it watering restrictions, so every seven years gardeners watch their hard work, manicured lawns and the beauty they created wither and die. In the suburbs drilling for artesian water sources was a flourishing business. As a young wife and mother I had first a pocket garden with an almost sub-tropical micro-climate due to a sunny vantage and thick white washed walls. Around giant strelitzes, avocado and mulberry trees the carefullly designed borders flourished. Later I had almost an acre in which to garden and loved every inch of the rich loam in which whatever I planted grew with vigor and beauty. When we moved to the Boston area many years ago I had to re-examine everything I had learned about gardening. Our first home was a three hundred year old carriage house set on an acre of land. We had hundred year old giant beeches on the property. The land itself had been neglected for years, but with care and attention a garden will emerge with alacrity from underneath the undergrowth and weeds. As I uncovered flower beds, dug and sowed, the garden returned to some of its previous glory. From spring to autumn we ate fresh produce from the rescued and resuscitated cold frame beds. I planted strawberries around the swimming pool, hosta in the shady areas and a riot of day lilies wherever I could. I learned to accept the cycle of the year, and reluctantly return my gardening tools to their permanent place in the garage each November. Come February the catalogs arrived and soon I would have spindly seedlings growing under lights. I planted myself in American soil in bringing that garden back to life. Now I have a much smaller garden again. It is all I want to manage. For me little else in life compares to the satisfaction of caring for a flower bed of rich dark soil where every plunge of the weeding fork or hand spade reveals not only the roots of the weed but wriggling earth worms too. Then you know you have an arable patch and the result is glorious peonies like these. I and also my pals appeared to be checking out the excellent solutions located on your web page while immediately got a horrible suspicion I had not expressed respect to you for those techniques. My guys ended up for that reason stimulated to see them and have in effect certainly been taking advantage of them. Thanks for genuinely considerably kind and also for getting such extraordinary information millions of individuals are really wanting to be informed on. My sincere apologies for not saying thanks to you earlier. Your blog is fine. I just want to touch upon the design. Its too loud. Its doing means too much and it takes away from what youve acquired to say –which I think is actually important. I dont know when you didnt suppose that your words might hold everyones consideration, but you were wrong. Anyway, in my language, there usually are not much good supply like this. Good weblog. I was checking constantly this website and I am impressed! Very useful information specially the last part I care for such information much. Excellent weblog. Plenty of helpful information here. I was looking for this.Thanks for sharing! Thank you for the good writeup. It actually was once a leisure account it. Look complicated to far introduced agreeable from you! By the way, how can we keep up a correspondence? Exceedingly insightful many thanks, I do think your current visitors may want a whole lot more stories like that carry on the excellent work. Terrific work! This is the kind of information that are meant to be shared around the internet. Shame on Google for not positioning this post upper! Hi, Nice job, I’ve bookmarked this page and have a feeling I’ll be returning to it regularly. Fantastic goods from you, man. I’ve bear in mind your stuff prior to and you are just too fantastic. I really like what you’ve obtained here, really like what you’re saying and the way during which you are saying it. You’re making it entertaining and you still care for to stay it sensible. I can not wait to learn much more from you. This is actually a great website. Thanks a bunch for sharing this with all of us you really know what you’re talking about! Bookmarked.Please also visit my site =).We could have a link exchange agreement between us! Hi webmaster, commenters and everyone else !!! weblog was absolutely wonderful! Hey, Wonderful article! This is very much helpful for my research and i hope to run through more of your posts someday! How i wish i can see you in person so i can get to know you more. Wonderful site. I was checking constantly this blog and I am impressed! Very useful information specially the last part I care for such information much. Magnificent site. All posts have a process to learn. Your hard work is very good and i enjoy you and wanting for some more informative posts. hello there and thank you for your info – I’ve certainly picked up something new from right here. I did however expertise several technical points using this web site, since I experienced to reload the site a lot of times previous to I could get it to load correctly. I had been wondering if your web hosting is OK? Not that I’m complaining, but sluggish loading instances times will sometimes affect your placement in google and can damage your high-quality score if ads and marketing with Adwords. Well I’m adding this RSS to my e-mail and can look out for much more of your respective fascinating content. Make sure you update this again very soon..
You really make it seem really easy with your presentation however I find this matter to be actually something that I think I might never understand. It kind of feels too complicated and extremely broad for me. I am having a look ahead in your subsequent submit, I will attempt to get the dangle of it! Greetings! This is my first comment here so I just wanted to give a quick shout out and tell you I truly enjoy reading through your posts. Can you suggest any other blogs/websites/forums that deal with the same subjects? Appreciate it! This website is mostly a stroll-by way of for all of the info you needed about this and didn’t know who to ask. Glimpse right here, and you’ll positively discover it. You can definitely see your expertise within the work you write. The world hopes for more passionate writers like you who aren?? afraid to say how they believe. At all times follow your heart. Effectively, this is my very first visit to your weblog! We’re a bunch of volunteers and starting a brand new initiative in a community throughout the same niche. Your weblog offered us useful information to work on. You’ve gotten carried out a marvellous job! Anyway, in my language, there are not a lot good source like this. Fantastic website. Plenty of helpful information here. I’m sending it to some buddies ans also sharing in delicious. And naturally, thanks to your sweat! I simply want to tell you that I’m very new to blogging and truly savored your blog site. More than likely I’m planning to bookmark your blog post . You certainly have perfect posts. Bless you for sharing your web page.